It’s one of my favourite times of year, new release week at May Arts Ribbon (you can check out all the new ribbons here)! All week long the design team have been featuring projects how you can put this seasons new releases to good use. Each Ribbonista was assigned a particular new release ribbon to try out. I was given the new metallic bakers twine. Kinda fitting since I’m have a love affair with gold and baker’s twine these days. Like I used on these handmade giftcards, and my gold polka dot tool box makeover. I’m kinda in love with this project. Because guess what? It took only a few minutes to put together! I painted a scrap piece of plywood. Strung the new gold bakers twine across and attached it to the back with thumb tacks. Then I could easily display pictures and quotes just with little clothespins. Do you adore these drool worthy gold foil quotes as much as I do? love em! They are from Die Cuts With A View Gilded stack. P.S. Incase you’re wondering, gold foil is insanely hard to photograph. I made this little ‘hello’ art. So simple and easy, but the gold really packs a punch! I turned this Michaels wood plaque (which was under $2) into a welcoming piece of art! I painted the circle wood plaque in a mint color and let dry. Then cut out the hello cut file on vinyl using my Silhouette and adhered it to the plaque. Give it a spray of metallic gold spray paint and let dry. Then remove the vinyl mask, viola, Art! 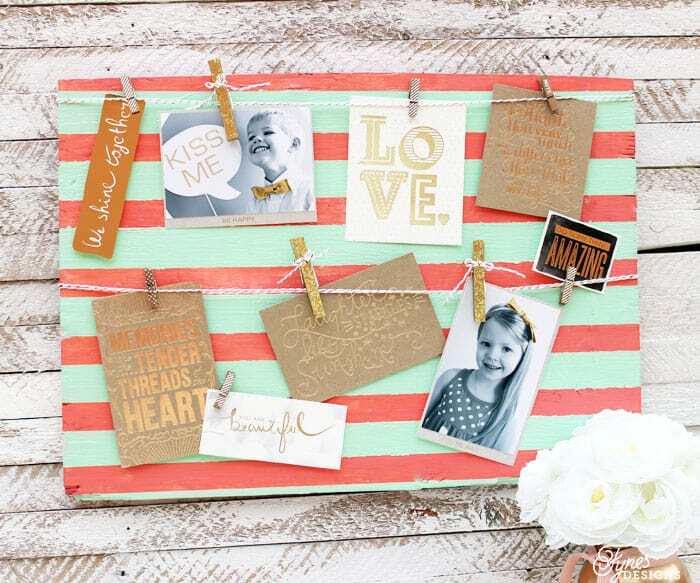 To create the coordinating hanger, just double over the May Arts gold bakers twine and attach to the backside with thumb tacks at the top of the frame. You can get the Free Hello Heart Silhouette cut file here. May Arts wants you to play with the new release ribbon too! Leave a comment here and on the May Arts Blog and you could WIN a selection of the new release ribbon! 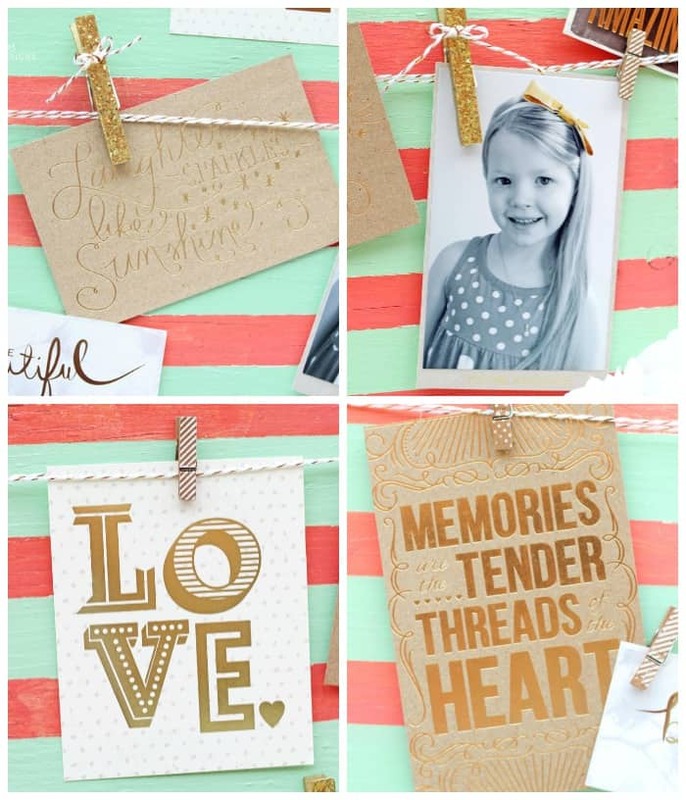 PLUS- Be sure to visit their blog for a bonus third gold bakers twine project! Good luck, have a great weekend! Thanks Claudine! I love playing with the new stuff! Must. Have. Flag banner and star banner ribbon! Hoooooly Moley! Seriously. If you are placing an order, I’m in. Will pay share of shipping! How can I order ribbon? I tried to website and it says that you have to be a company to order. 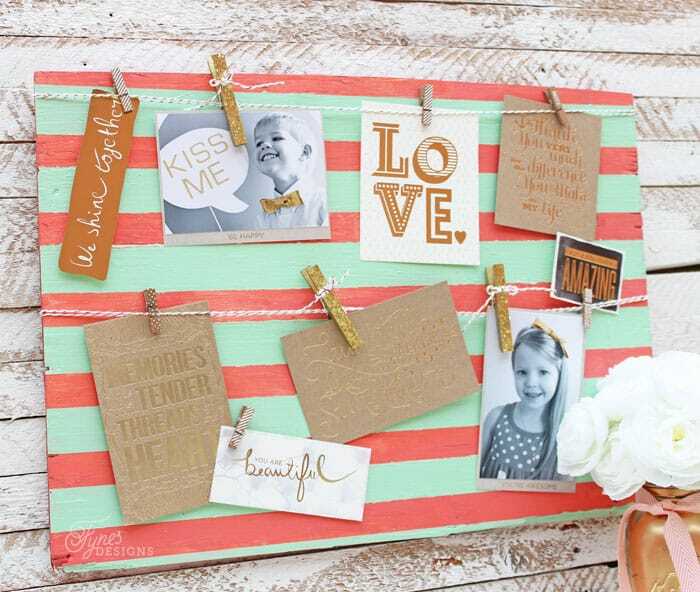 What a beautiful project, and so clever using the string for a clothesline photo display. The gold really pops, I love it! Thanks for sharing your lovely creations, they are amazing. I just love your frame with all the gold elements! So cute! Wow! This is adorable! 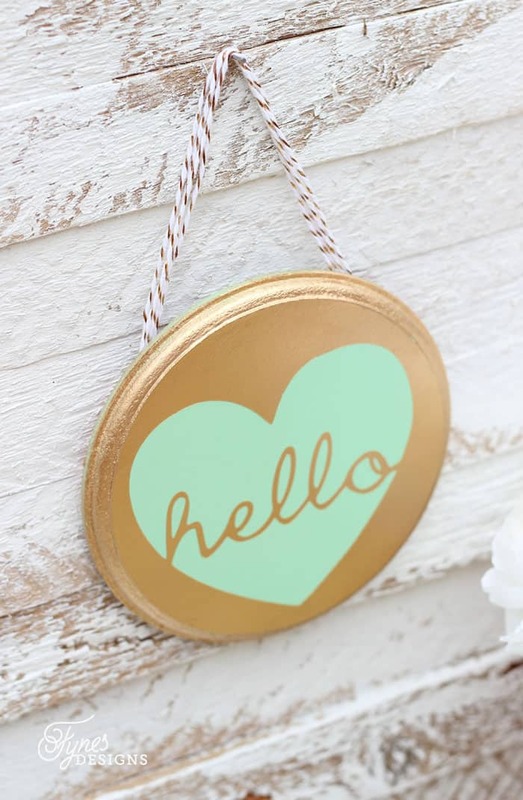 Love the gold and mint together!!!! Great way to display your pics! 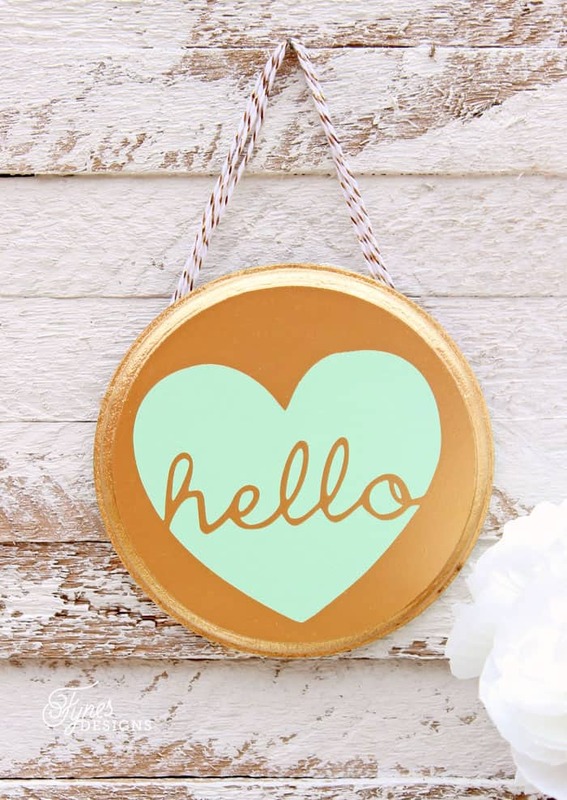 The clothesline frame is darling and that is the cutest little hello plaque! I am in love with gold paint/accents right now and this is just icing on the cake. TFS! Wow, I love all of this, it is so beautiful and that gold just pops! Thanks so much for linking up at the Creative Collection Link Party! LOVE anything shiny, so my eyes are just gleaming at your projects. Esp love the little Hello piece!!! Love all of this, the colors are perfect!